The third installment of the Mario racing series. Choose from eight characters, an engine size, and a cup. Race through the four circuits of each cup and place in the top 4 to win points. The racer with the most points at the end of the Cup wins the trophy. 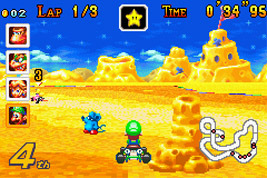 Other modes include Time Trial, where you can aim for the best times on each circuit, and Quick Run, throwing you into a random race against a computer player. Link two Game Boy Advance systems to race in limited single-cart multiplayer, or full multi-cart multiplayer.